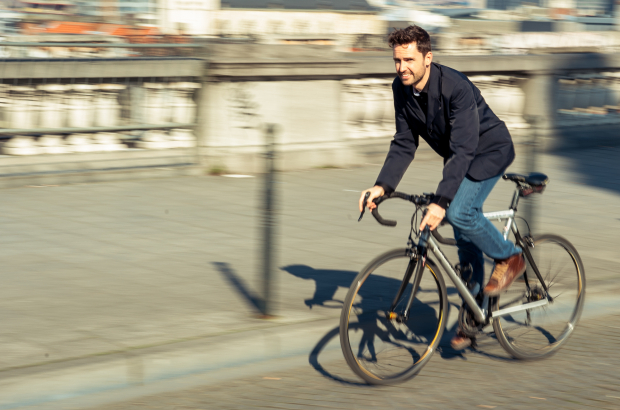 To settle the question once and for all, the Brussels Cycling Union carried out a test: If you live in the burbs, is it faster to get to work by car, public transport or bicycle? The organisation carried out a test this morning with commuters headed into Brussels, Antwerp and Ghent. The travellers in each city all had to get from one specific location to another in rush-hour traffic. The destinations were all in the centres of each city. And still, the cyclists got to the designated point first nearly every time. The commuters arrived in Brussels from Asse, Jezus-Eik and Tervuren. The cyclist coming from Jezus-Eik had the most impressive time compared to the others: 37 minutes, compared to 50 minutes for public transport (bus and metro) and 51 minutes for the car. The others were less impressive but still showed that the bike is a good alternative to public transport and certainly better than the car: The cyclist from Tervuren beat the public transport user by five minutes but beat the car by 10 minutes. From Asse, there was only one minute difference between the cyclist and the public transport user, who arrived in 36 minutes. The driver spent 50 minutes traversing the 13-kilometre commute. In Antwerp, the test was carried out leaving from two different locations – Aarselaar and Boechout. Cyclists did best out of Aartselaar, followed by the car, with public transport pulling up just one minute after that. But among those leaving Boechout, public transport was eight minutes faster than the bikes, though a combo of public transport and cycling was faster still. Three locations were connected to the centre of Ghent, with the cyclists winning every time. Those taking public transport from Melle, spent nearly 50% longer getting to their destination than the cyclists. Of course in reality public transport times vary greatly, depending on how close you live and/or work to a stop. Still, it’s clear that cycling could save drivers a lot of time currently spent in traffic. The advantage of the collapsing bicycle is that it is anything but difficult to go up against open transport. In this way, in the event that it is extremely raining hard, I can take it on the underground. Similarly, if there are steep climbs I take it on public transport and come back down by bicycle. You settle on the effort you need to assignment help acknowledge so you don't land at meeting sweaty.